Oh my goodness, can you FEEL THE EXCITEMENT???? We crafters are nothing, if not reeeeeally skilled at stringing out a moment, you feel me?!?! 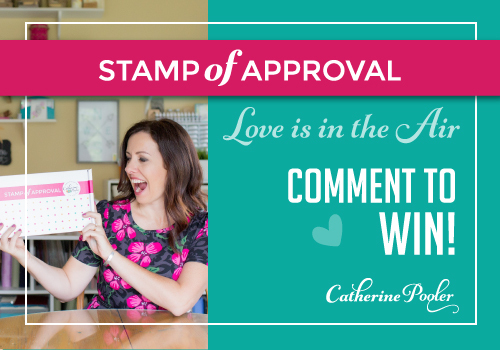 You've come to hear about the Stamp of Approval collection, so climb aboard the crazy train and let's go! But before we get to the card, let's talk about the Stamp of Approval Collection. 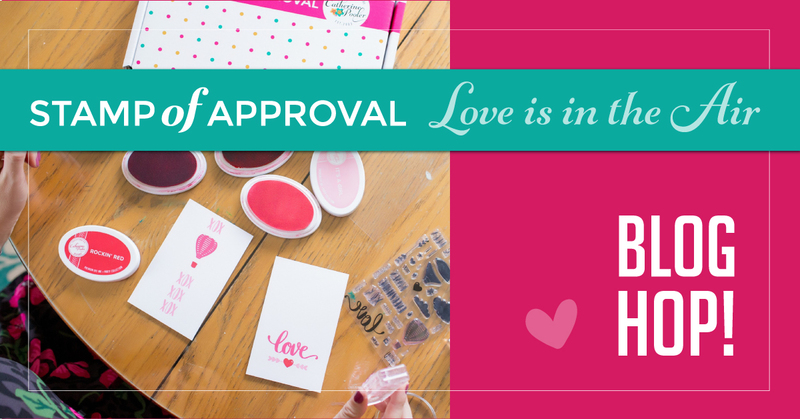 If you aren't familiar with it, the Stamp of Approval collection is an exclusive collection of crafting goodies that are boxed up in a fantastic package to keep you crafting for weeks and months on end! The items in the collection are designed exclusively for the package and are not available individually for many more months after the collection is released. Find out more about the Stamp of Approval collection here, and be sure to subscribe to the wait list to be notified of the sales link, because the collections sell out VERY quickly! AND....spoiler alert: Surprises! The first card uses the Suburst Die from the collection. Look at this die and tell me you don't immediately think of fireworks?? After cutting and scoring a 4.25 x 5.5 inch piece of CPD premium white cardstock for a card base, you'll want to set it aside and then cut a panel with the same measurements. Don't you just love using old faithful card-making techniques like ink smooshing? Techniques like this will save your bacon every single day. 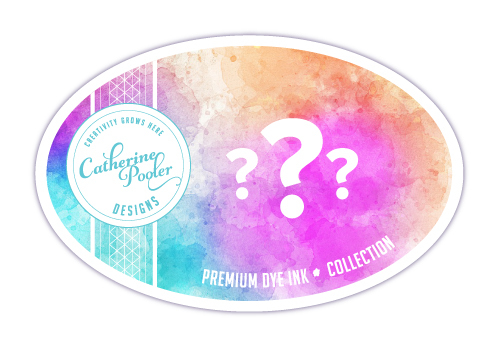 You'll want to use a mystery goodie in the box along with your favorite Catherine Pooler inks for the background. Smoosh the inks on to an acrylic block, spray the block with water, and then use the block to smoosh the ink around on your card panel. Heat set the panel and then repeat the ink smooshing and heat setting process all over again until you get the layers you want. Then, grab your Sunburst die to cut several pieces from Catherine Pooler premium white cardstock. Layer them up around the panel to create your faux fireworks. BONUS: These fireworks are so safe, even a baby could handle them! ☺Now take a deep breath cause the hardest part is over! Use a few stamps from The World Awaits stamp set in the collection to create the sentiment panel. If you prefer a bolder sentiment, double stamp the sentiment and then die cut it with one of the small dies from the Postage Stamp die set in the collection. And now here's your chance to use up some odds and ends in your scrap drawer! I chose random enamel dots that matched the ink colors, but you could use sequins, Nuvo drops, or anything else that strikes your fancy! Adhere the panel to your scored card base. Bear with me while I swoon over these hot air balloons!!! Have you ever been on a hot air balloon ride? Definitely a bucket list item for me. For the second card, pull out the Love Is In The Air stamp and die set. You'll want to grab your favorite Catherine Pooler inks again, too! Cut and score your 4.25 x 5.5 inch card base and then cut a panel of the same dimensions. You'll want to mask off the bottom portion of the card and then use an ink blending tool and your favorite blue shade to create the sky. Then, stamp the hot air balloon images, die cut them out, and glue them to the panel. Die cut the clouds from the same cardstock and glue them to the panel as well, tucking them behind some balloons and then leaving them in front of some balloons. This will give you depth and variation to the panel. Choose a sentiment from the set and stamp it in the masked off bottom portion, and then finish off the card by gluing the panel to your card base. Time to get to the good stuff! 6. Kelly Martin--you are here! Kelly, your cards are adorable. I love them. I didn't think I'd like the starburst but now that I see it in action, I love it too. Great job. LOVE your sweet cards Kelly!!! I love your creativity in using the sunburst die. So cool. Thanks for your kind comment, Clare! Enjoy the blog hop! Beautiful cards, Kelly! I really like that sunburst one! Can't wait to see what you create on SN! Oh, thank you so much Jenn! :) SN is such a great community! These are beautiful Kelly! That sunburst one is fantastic! Can’t wait to find out what that new ink color is!! Can't help but smile at the word "smooshing" ... and it looks great too. Pretty cards, Kelly! I'm in Laurel's facebook cardmaking group - my ink color guess keeps changing! Haha! I"ll go back to yesterday's guess of Pretty in Pink. What a great guess, Avra!! I hope you enjoy the new ink color! Oh my ! Your cards are absolutely lovely ! Thank you so much Marjorie! Hope you're enjoying the blog hop! Love your cards - amazing! I can only imagine the smile on the person's face who gets to receive one of these cheery cards. :) I'm a StampNation member. What a kind thing to say, Donna! :) I hope you enjoy creating with the collection!! And I hope you join us for the PJ Party tonight! Great cards! The one with the sunburnt is very creative. I 'm a Stamp Nation member. Thanks, Jean! :) I hope you'll be joining us for the PJ Party tonight! Ink Smooshing - MASTERED! Love these cards! Haha! :) You really can't mess this technique up, which is why I love it!! Kelly your cards are amazing and the Sunburst one just blew me away. I am a Stamp Nation member. Yay! Thanks Ellen! I hope you'll be joining us for the PJ party tonight! That's awesome, Diane! I hope you enjoy your SOA collection and maybe I'll see you tonight at the SN PJ Party!!! Thank you, Dee! The items in the collection are SO fun to play with! I love the way you used the sunburst die! So cute! Great cards! I love how bold they are! Thank you! I'm normally not a bold cardmaker, but it all just kinda came together! Lovely cards - so bright and cheerful! Thank you Lynn! Enjoy the blog hop! Such happy cards! I love the colour combos too! Thank you Jodie! This was a great practice in stretching my creative skills, haha! ohhhh ink smooshing! I haven't done that in awhile - your cards are making me want to stay home from work today and stamp! Love them both Kelly! Ink smooshing is my technique focus for this month! :) I'm hoping to get lots of practice in, haha! Nice cards! Very innovative with that sunburst die. Like your choice of soft colors on the balloons. That's so kind! Thank you! I love your "smooshed" card. I've tried the technique - - but I'll have to put ink on the acrylic block and spritz with water and then apply to paper. I think the key to remember with this technique is that you just have to be patient and keep working with it! And also let go of any expectations, haha! :) Enjoy the hop, Laura! I really like your hot air balloon cards. Thank you Lacey! Hope you enjoy the hop! Super cute cards! I definitely need to try ink smooshing.. I love how that looks. Yay Kara! I hope we'll see you tonight for the PJ Party! 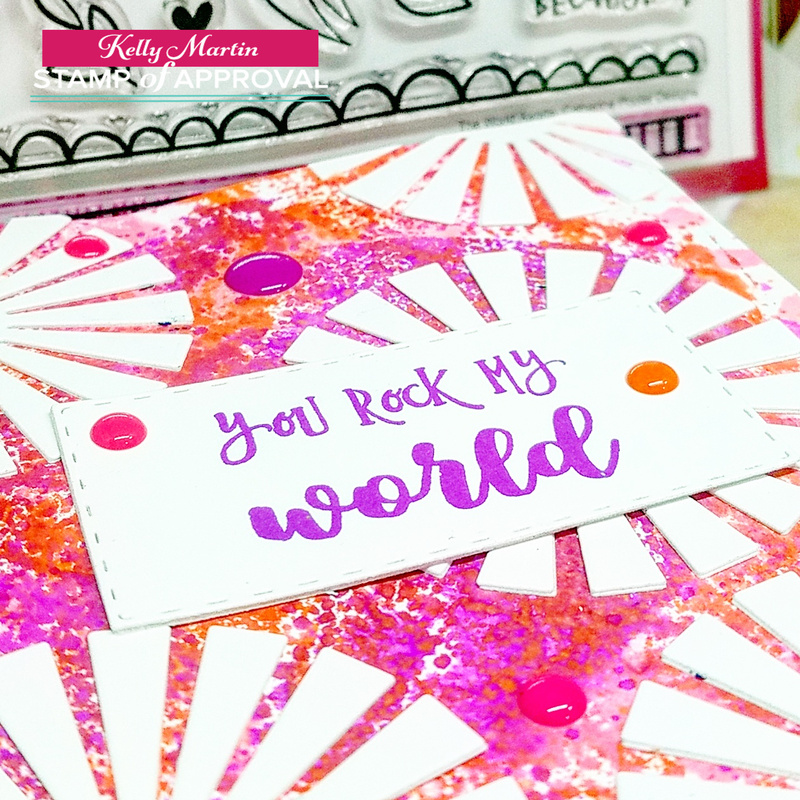 I love the colors you used and how you used the sunburst die! Adorable! Thanks, Mary! That sunburst die was the best thing to stretch my creative process! I have ink smooshed before, but not with my acrylic blocks. 🤔 Definitely going to try that soon! You cards are lovely! Thanks for sharing! Yes! give it a try and see what you think! Sometimes it can cause color blocking, but if you're patient and just keep working with it, you can have good results! Wow - Kelly - I love the sunburst die as fireworks - how cool! That is SO kind, Wanda! Thank you! I hope you enjoy the collection! Thanks Kathy! :) Enjoy the blog hop! Wow what adorable card! I love them both but that sunburst one is amazing! That's so sweet, Sue! :) I hope you enjoy the blog hop! such a clever way to use the star burst! beautiful cards! Thanks for taking the time to comment, Bethany! Oh wow, these are fabulous cards! Love your color choices and this new SOA collection looks wonderful!! You rocked my world with the sunset die card! Haha, that is so sweet, Elizabeth! Thank you so much! Awesome cards Kelly! Amazing way in using star burst sure is great to see it in action. Thanks for sharing your cards. Thanks Sharon! Hope you're enjoying the blog hop! Creative use of the sunburst. This kit is looking very appealing right now. That's so kind, thank you Sue! that is such a great guess!! :) I love it! Love how bright and cheerful your cards are! Totally agree with the ink smooshing! Love doing that. Bright is definitely my style, haha! Glad you're enjoying the hop Colleen! Phenomenal cards!! As a new stamp nation member, I'm very excited for this box!!! Oh Lorie, I'm so thrilled that you're a part of SN! It's such a great community, and I hope you LOVE the collection. Hugs! GREAT cards! Love the way you did the sunburst on the first card! So cute!! Thank you Clare! That die is quickly becoming a favorite of mine! I love your cards. The sunburst card is so colorful. Thanks for the tips on the smooshing technique. I'm going to have to try that out! Your first card is so artsy and I love that. Thanks for the kind comment Rebecca! Just amazing bursts of color and fun! Love your happy cards! Very cheerful! Thank you for opening my eyes to the starburst die!!! All you had to say was fireworks and the wheels in my head starting churning. Yay!! That's what I love about the creative process! Great cards and a cute idea for using the burst die. Thanks Theresa! Hope you are going to take advantage of the collection! Great cards! Your background on the sunburst card is perfect for the "fire works" you created using the sunburst die! I am a Stamp Nation Member. Yay Jane!! Did you tune in to the PJ party last night?! It was SO FUN! So many ways to use the sunburst die, love it. The hot air balloons are so pretty. I haven't personally been in one...height issues, but I love the look! Stunning cards, thanks. I am a SN member. thank you for sharing Kelly totally enjoyed your cards! I love the layers of color on the first card - Beautiful! Thanks for the chance to win! The more I see of the sunburst, the more I'm coming to love it. Looking forward to my first PJ party as a SN member tonight! You inspire me to get messy with the ink smooshing right this minute!! Great use of the sunburst. That sunburst is really fun...and bright! Cute cards. Can't wait to get the sunburst and try it out! Look what you did with that sunburst. I love that it turned into fireworks. This collection is so versatile. I love it. Thank you for sharing. Sweet and adorbs! Love your designs. Wonderful cards...love the look you created on the first. i'm so glad you explain how to make the cards - when I saw your first card I thought that you had masked, then smooshed.....I think too hard! You did it the easy way and I just couldn't see that at first! Great Job! Adorable cards, Kelly! Love the ink smooshing technique. It's something on my list to try this year! Can't wait to get this SOA and be at the PJ party tonight! Thanks for sharing. So so so pretty! This box is going to be so much fun to play with! Love your cards. You used the sunburst die in a fun new way. These are so pretty. I love the sunburst card, thank you for sharing inspiration. Kelly, I'm a child of the king too. Love your Sunburst card. what beautiful creative cards. Can't wait to start. Your cards are the best eye candy! Scrumptious and beautiful! What fabulous and fun cards!! Both cards are beautiful. The sunburst card is amazing. Love the colors. Thanks for sharing. Love the fireworks. I need to go get messy with my inks. Great cards. Can't wait to get my hands on these. Such great cards. Fireworks for sure. I love these cards. Oh my the sunburst is my favorite because it looks like an art piece in a gallery, by using the burst as umbrellas, that people are holding up to create a flower effect. Just love it. And all your cards are beautiful. I loved your way of thinking on the fireworks with the sunburst die...I thought the same!!!! Such happy bright fun cards! What a great technique! These are so pretty. Love the color! Oh my goodness that ink smooshed background is AMAZING! Great cards - thanks for sharing. I totally agree - I see fireworks with that sunburst. Love the smooshing to get different background colors. Beautiful cards from a SN member. Thanks for the inspiration! A neat way to use the sunburst. Love the smooshing technique! Your cards are great! very cute cards! Love how you've used the sunburst! Your firework/sunbursts rock MY world! I love how you used that die, and the smooshy background is the perfect setting for them. So much fun to see the endless ideas with these supplies. Thanks for the inspiration. cute cards and great ways to use the stamps and dies. Well, no, I didn't think of fireworks when I saw the sunburst. But now I do and the card is great! So cool! I love your techniques. Very creative use of the starburst. Love it!! The background is fabulous! Love your balloons, too. I love all your cards using this SOA Box!! Beautiful cards, LOVE the sunburst diecuts over the pretty ink smooshed background, just stunning! Love the ink smooshing - a lot! Gorgeous cards. In Love yet Again! Love being a StampNation member. I love the Stamp of Approval collections because everything in it works so well together you don’t have to think about it. The cards practically make themselves. I love just how many different ways these products can be used together. Hard to choose a favorite product but I’m leaning really hard in the direction of those postage stamp dies. Ink smooshing is so much fun and makes awesome backgrounds! Love that fireworks card! Great cards!! Really love the colors on your hot air balloon card!! Great Cards! Love the sunburst technique you used! I love the simplicity of your cards Kelly. They actually make me think I can make a card I could actually give or send to someone. Really fun cards, especially the sunburst one! Your designs are so cool. Thanks for sharing. Such fun, colorful cards! Love the ink smooshing technique! The starburst card is my favorite! I've been really impressed by how lovely the ink colours are over the last three days. Your cards really showcase how vibrant the inks are. Thanks for the inspiration. Such fun and colorful cards. Love your designs. Kelly, the first card really makes me think of fireworks with all those colors smooshed together. I really think that the hot air balloon card is very neat. I too want to ride one of these too! Fabulous cards, Kelly! I look forward to seeing more of your work! Fantastic cards, I love the ink colors! I totally agree with you, CP!! Gorgeous color smooshing and blending. Wow! Love your fireworks card! Really great cards. I am a Stamp Nation member. The way you used that sunburst die is great! I love the smooching too. Bravo! Amazing cards. I just think the way the sun die looks like flowers in your first card is so clever. I’m so sad that this is the last day for the blog hop. The DT has done an amazing job. I love the way you used that sunburst die. Thanks for the inspiration!! Awesome cards! I love your bright colors! Cool and different cards from this kit! Beautiful cards! Love the sunburst die! Lovely card ideas! The sunburst is super cool! The sunburst with the pink/purple/orange is pure 60's fun. It just makes me smile. Thanks for sharing you great ideas and creativity with us! Beautiful cards, Kelly. I particularly love the first one. The sunbursts also make me think of paper umbrellas. So fun. HA! I put my comment in the wrong spot. Sorry about that! I was trying to say that I love how you used this SOA in different ways. The top card really shows a different way to treat the sunburst. Thanks for sharing your ideas! Love your use of those white die cuts over the colorful backgrounds!! So pretty!